The Wolfpack is peaking at just the right time closing the regular season with two wins and two ties to finish in sixth place heading into the post season. It was just a matter of time. The team lost several players to graduation and are under the guidance of first year head coach Rob Bramwell. As a result, the first half of the season was spent getting in shape and restructuring their strategy to Bramwell’s coaching technique. 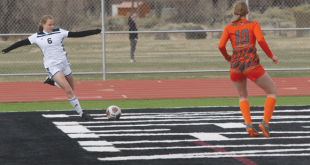 The turnaround officially came when they tied Durango two weeks ago, the top team in the league. 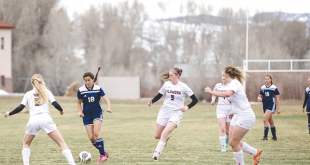 Since then, the team picked up steam tying the Gunnison Blades “A” team, the second place team in the league, last week and then beating them in Gunnison on Friday night. They then closed the regular season with two games at Big Mine Ice Arena against Steamboat and after a shaky 6-6 tie in the first game, they exploded for a dominating 6-2 win to finish with a record of 8-9-3 and enter the post season the sixth seed out of ten teams. The final week rush by the Wolfpack started on Wednesday, February 4 when the Wolfpack faced the Gunnison Blades “A” team at Big Mine Ice Arena. Still fired up from their strong showing against Durango the Wolfpack dominated the first period opening up a 1-0 lead when Ben Frame assisted Robbie Holleran on a goal two minutes into the game. The Blades threatened to tie it up but Wolfpack goalie Zach VanDyke had numerous big saves with the help of his defense. A two-man rush to the Pack net looked threatening until VanDyke made the save and Kyle Hecker swept the loose puck off the goal line. The momentum soon shifted in favor of the Blades as the Wolfpack were pinned in their own zone for most of the second period. Blades players Luke Schumacher and Evan Ayers connected to tie the game three minutes into the second period. Despite the shelling, the Wolfpack remained strong holding off a Blades assault that lasted almost the entire game. Notched in a 1-1 tie with 31 seconds left in the game and both Holleran and Hecker off the ice with penalties, the two teams lined up for a face off in the Blades zone. Jake Grogg won the draw pushing the puck back for a wrist shot blast by Evans through traffic to give the Wolfpack a 2-1 lead with just 18 seconds remaining. The Blades pressed the puck into the Wolfpack zone and a failed clearing attempt up the middle by Crested Butte gave the puck up. Mike Spallone picked the puck off a Wolfpack defender and found Pete Turner open on the weak side for the game-tying goal in the final eight seconds. “I was psyched with the way the kids played but you could tell the vibe in the locker room felt like a loss,” says Bramwell. With the bitter taste of a tie still fresh in their mouths, the Wolfpack headed down to Gunnison on Friday, February 6 to face the Blades “A” team once again. This time the Wolfpack stayed out of the penalty box and the defense cut the Blades offensive assault from 34 shots the game before down to 23 shots on net Friday night for a 3-2 Wolfpack win. Again Holleran gave the Wolfpack a 1-0 lead in the first period, this time off an assist from Hecker. But, again, the Blades came charging back in the second period as Shane Mcguinness netted two goals to give the Blades a 2-1 lead heading into the third period. Midway through the third period Evans tied the game 2-2 with an unassisted goal and two minutes later Grogg scored his first goal of the season to give the Wolfpack a 3-2 lead and the Wolfpack held on for the final five minutes of the game to seal the win. Sunday’s games against Steamboat marked the return of key defenseman Jake Sunter to the team and the last time Holleran would play for the Wolfpack at Big Mine Ice Arena. Last season, Wolfpack Holleran led the Rocky Mountain Youth Hockey League in scoring with 40 goals and 34 assists for an average of 3.89 points per game and the Wolfpack reached the final four in the state tournament for the first time in the team’s history. This season, Holleran is at it again and closed his Wolfpack career at Big Mine Ice Arena in fantastic fashion with four goals and five assists in his final two games at home to finish the regular season the league’s scoring leader with 28 goals and 22 assists despite playing in less games than all of his peers at the top of the scoring leader board. In fact, at one point in his final home game, Holleran turned to me during a face off to claim he was going to score one for me. Fifteen seconds later, he delivered. The Wolfpack jumped out to a 3-0 lead in the first game but by the second period they were down 4-3. The two teams traded goals through the second period and then Holleran provided the game-tying goal in the third period on an assist from Jena D’Aquila. Disappointed with the tie, the Wolfpack came out in the second game sluggish giving up two soft goals to the Steamboat squad. The Wolfpack recovered to tie the game by the close of the first period on two goals by Evans. From then on it was all Wolfpack. With Sunter providing strength on defense and Ricky Sandoval working harder than everyone on the ice combined, Crested Butte held the puck in Steamboat’s zone for most of the second and third periods. Crested Butte rattled off four unanswered goals including the last strike coming from D’Aquila closing the regular season with a 6-2 win. The Wolfpack head to Grand Valley to play in a best-of-three games format in the first round of the playoffs Saturday and Sunday, February 14-15. If the Wolfpack win two of the three games, they advance to the RMYHL Frozen Four championships in Gunnison February 21-22. “If we play with that same intensity there’s no reason why we can’t make it to the finals,” says Bramwell.